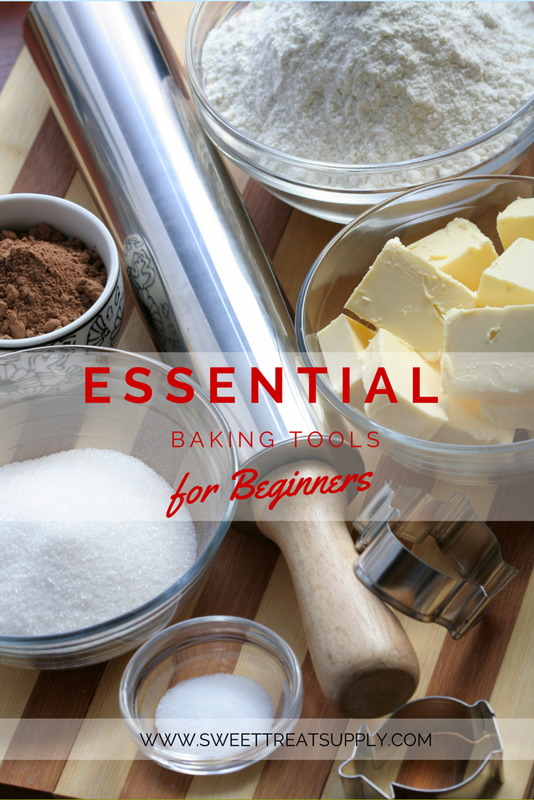 If you’ve decided to start learning how to bake, congratulations! You have a fun — and delicious — hobby ahead of you. Baking is a great creative outlet and a wonderful opportunity to make tasty treats for friends, family, coworkers and more! To get started with baking, you’ll need a few tools to help you make the most gorgeous and scrumptious treats around. Measuring spoons and cups — Especially in the beginning, it’s important to measure every ingredient in your recipe. Consider purchasing two sets of each, so you don’t have to do without if a crucial measuring spoon is in the dishwasher. Graduated measuring cup —Just like with dry measuring cups, graduated measuring cups will be essential to your baking success as you learn how to bake. Graduated measuring cups are for liquid ingredients and have a handy pour spout. A silicone spatula — Silicone spatulas offer excellent heat resistance and are most often used for scraping dough off the sides of mixing bowls. We rely on spatulas that are all one piece, rather than ones that have a separate blade and handle, as they hold up better. A straight spatula — Completely different from silicone spatulas, straight spatulas are often made from metal and are used to shape icing while decorating cakes. As you continue with baking, you may want other icing spatulas, but at the beginning, an 8” straight spatula should do. Decorating tips, assorted — Often referred to as piping or frosting tips, decorating tips help you get just the right design of icing for your cake. As you can see from our selection, there are a ton of decorating tips to make your icing into the perfect shape. We’d recommend starting with a small set and moving up from there. Thermometer — If you’re considering also making candy, a candy thermometer is a must. If you’re not interested in candy making, consider purchasing an oven thermometer to ensure your oven is the correct temperature for your recipes. Cake pans, assorted — This is obvious, but having a good cake pan is essential to making a good cake. However, don’t forget that you might need more than one pan, whether to have different shapes — don’t forget a cupcake pan if you plan to bake cupcakes, for example — or to be able to make layer cakes. Timer — While you may not need a whole new tool for this (your oven timer or even your phone may do), it’s important to figure out what you’ll be using as a timer before you begin baking. Whisk — Many recipes call for whisking ingredients, so don’t forget this vital tool. After a few times baking, you may decide you’d like to have a few whisks of various sizes to help you make your treats even more perfect. Sifter — While fewer recipes you’ll find these days require the sifting of ingredients, you’re still bound to run across a few that ask for sifted flour or other ingredients to make the treat lighter and airier. Baking sheets — Baking sheets are essential to baking cookies, pastries and other delicious treats. Here’s one of our favorites. Cooling rack — Having a set of cooling racks will help you prevent cookies from overcooking and enable you to use your baking sheets while the previous batch of cookies are still cooling. Bowls, assorted — You’ll probably always be amazed by how many bowls you use while baking (we always are! ), so go ahead and stock up on a variety of different sized mixing bowls now. You’ll thank us later. Rolling pin — A good rolling pin will help you make bread, cookies, pie crusts and more. We’re partial to the French variety of rolling pins, which are tapered to aid in rolling out thin, uniform circles of dough. Pastry brush — Recipes that require an egg wash or other liquid brushed along the top need a pastry brush. It can spread butter, oil or glaze on food, giving the tops of your baked goods a delicious look and taste. Pastry cutter — Essential for pie crusts and a number of other doughs, pastry cutters help avoid overworked dough while cutting the chilled ingredients, such as butter, into one another. Parchment paper — Parchment paper is ideal for baking. It protects your baking sheets (does anyone want to spend all day scrubbing dishes?) while helping your treats bake more evenly without having to grease the pan beforehand. Our favorite parchment paper is made by NORPRO, and we love it because of its environmentally friendly design. Wax paper — Just like parchment paper, wax paper is an absolute must for some recipes. You’ll use wax paper in recipes like no-bake cookies, candy making and more. Electric mixer — Okay, so maybe you can do everything an electric mixer can do by hand, but do you want to? An electric mixer can help you get the job done faster and easier. Don’t feel like you need to buy a stand mixer right away, though: For many beginning bakers, a hand mixer does the job just fine. Did we forget any tools you’ve found to be absolutely essential? Let us know in the comments below!